Here at YoGov, we’re incredibly proud to be making government services more accessible for everyone. We’ve helped hundreds of thousands of people navigate confusing government information and processes in over 20 states, thanks to our virtual and in-person government services concierge team, and we continue to help more people every day. Given our dedication to transparency in the face of questions about our services and our pride in how we operate, we've decided to open the kimono and share more about who we are and how our mission defines our operations behind the scenes. As a mission-driven team, we believe there is a future where people have greater accessibility to critical government services. At the same time, we believe government strongly benefits from this too (get ready, we’ve included data below!). Just like Lyft and Lime who have added more mobility options to increase accessibility, we’re adding clear, human-friendly information and modern services to increase access to and adoption of government services. Without further ado, here’s an in-depth look into our company. 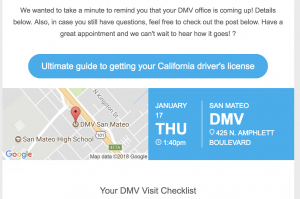 In this first post, we'll start with a deep dive into our Express DMV Appointment service. It’s no secret that peoples lives are dramatically affected by their ability to access government services. A soon-to-be mother needs her driver’s license before she gives birth so she can take care of her child. A daughter needs a passport quickly to visit her mother abroad who's having health issues. A father is working two jobs and can’t afford to take time off work to wait in line at the DMV, or wait 2 months for an appointment after losing his license; he needs to get it back immediately to keep his job and provide for his family. We’ve all been there at some point in our lives: in line at the DMV. We've likely felt anxiety or apprehension because we've either just moved to a new state, or lost our license, or were missing work for the 3rd time to wait in line because the information available on government websites about required documents was confusing, or missing altogether. Struggling to find answers to ostensibly simple questions at the DMV is what inspired our founder to start YoGov 2 years ago. He wasn’t sure exactly what he needed to do to transfer a vehicle title between family members, and was unable to get clear information despite multiple DMV visits and phone calls. It wasn't until three months later, that he was finally able to stumble upon the simple answer he'd been looking for the whole time. In the following days, he put up a simple, clear blog post on how to transfer a vehicle title, including an invitation to reach out to him with additional questions. Others who were confused took him up on it. And so, we began our mission of providing information and services to help people understand and navigate government-related needs. Our most widely used service has been our Express DMV Appointment service. It's also been our most widely misunderstood. Our customers don't care about how the sauce is made -- they just want to know when they can get a DMV appointment -- so we simplify our message to them and present our Express DMV Appointments as a service to "get an appointment in 3-4 weeks". We focus on the benefit, not the process. A number of people have asked us if we're harvesting or hoarding appointments somehow, without realizing that DMV appointments cannot be individually sold or transferred. Once you book an appointment in someone's name on the DMV website, which is what our virtual concierges do, it cannot be changed in any way, or be used by anyone else except that person or their family member. This means we have no way to grab an appointment without a real customer to book it for. In reality, our service is the equivalent to having your receptionist or personal assistant check the DMV website hoping to find a last-minute opening or cancellation for you. But most of us don't have a receptionist or personal assistant, nor can afford to find the time to refresh a website for hours or days on end, which is where YoGov comes in. Yes, we may be a Bay Area-based startup, but we don't use any bots or software to book appointments. Just real-life people who step in to act as a virtual assistant for a customer for hours or days, until they can find them a great DMV appointment slot. After which they move on to help another customer. Stephanie (see Yelp review below) is a real-life YoGov Express DMV Appointment customer. She couldn't afford to take the time off work to help her ill father get his Senior ID, but she also couldn't afford to wait an additional 1-2 months to get an appointment, because people with dementia (like her father) tend to get lost easily and it's dangerous for them to go out without ID on them at all times. As per her review above, the earliest appointment she could find on the DMV website was 3 months later, in March. So she found YoGov, and requested our Express Appointment Service. Based on her location and the type of DMV appointment requested, her appointment request was assigned to our concierge Mildred. Mildred’s job? To keep an eye on any special requests or questions from Stephanie, and to assist her in finding an earlier appointment for her dad within 25 miles of San Francisco. It's not an easy process to find earlier appointments manually, but we’re committed to helping people who need it the most. So Mildred gets to work, monitoring available DMV appointments within easy travel distance of San Francisco and looking for a great appointment slot to open up due to someone else canceling. Five days later, Mildred finds a good appointment for Stephanie's dad, just three weeks later in January. She sends Stephanie an email with the good news, including the appointment date, time, location and links to easy-to-understand information about what documents her dad will be required to have with him at the DMV. We've learned that a large percentage of people forget to go to their DMV appointments, so the day before her dad’s appointment, we send Stephanie a reminder so she could notify her dad. We also send a follow-up email after the appointment to hear how it went and to see if they need any further assistance navigating the DMV. The good news? Her dad was able to successfully get his Senior ID in one visit thanks to Mildred and our appointment concierge team. He brought everything he needed with him, and was in and out of the DMV in 45 minutes. Inspiring stories like these are what drive our team forward. We're building and growing a team of people who genuinely want to help you with government services. By the numbers: we're helping the DMV too. We conducted a survey last year that showed that of the general public that visited the DMV, 20% of respondents had to make a 2nd trip to the DMV for the same service. Often, this was due to confusing information that led them to bring incorrect or inadequate documentation. That doesn't even include people who missed their DMV appointment altogether and had to make another one. Then, we surveyed our users and found that 97% were able to resolve their DMV needs in a single visit, which is a 17% increase over the general public. That's fewer people waiting in lines at the DMV or making 2nd DMV appointments, which decreases wait times and increases appointment availability for others. The Real ID requirement will only exacerbate the repeat-visit issue for the DMV, as we're estimating that 30-60% of Real ID applicants get turned away on their first visit due to the confusing document requirements. And with only 2-3 million Real IDs issued the first 10 months they were available, we're looking at over 20 million Californians who do not yet have their Real IDs and will likely only start visiting the DMV in droves as the deadline nears and panic sets in. As millions of Californians visit the DMV this year and next to get their Real ID, one of the most important things we can do is educate users ahead of time. We do this on our blog where we’re constantly explaining complex processes, we do this by email when people book our services, and we do this over the phone and by live chat. Our goal is simple: We want people to ask us. We’ll do our best to say "even if you didn't see it on the DMV website, you can't do this online because you're over 65," or "you need to go in person with these 4 documents, but only these 2 can be photocopies," or "that's an uncommon scenario we're not familiar with yet, but here’s the DMV’s phone number if you want to ask -- let us know if they don't have the answer and we'll research it for you." We’ve helped hundreds of thousands of people this way, through our extensive online customer support system and our incredible team of government service experts. 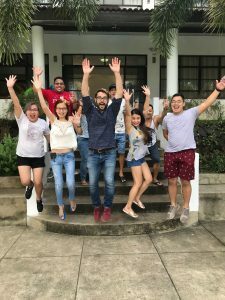 YoGov for Good: What’s next? In our next post, we’ll dive deep into our Independent Contractor network of in-person government service concierges that help people take their road test, wait in DMV lines, and renew their passports. We’ll also share more about what’s on the horizon, which includes visas, marriage certificates, name changes, and more. A thank you to the California DMV for their hard work continuing to make improvements that are making a big impact on Californians. For example, they've dramatically reduced wait times across DMV's as reported here by Bryan Anderson of The Sacramento Bee. Another thank you to Assemblyman Tyler Diep who's recent legislation encouraged us to share more about who we are and how we're helping. We're excited to share even more in the coming weeks and beyond!